2019 Camaro ZL1: Minimal Exterior Changes – The Bunch Blog! The 2019 Chevy Camaro is getting a pretty radical facelift for the new model year. Or at least the V8 SS is, with its enormous new grille. The four-cylinder and V6 models are a bit more conservative. But apparently Chevy is playing things even safer with the 2019 Chevrolet Camaro ZL1 based on the spy shots above. Up front, the new ZL1 is unchanged. So too are the sides. While it would have been interesting to see something a little fresher up front, this is surely a good thing for those who may have feared another rendition of the controversial SS fascia. The main changes are in the tail. 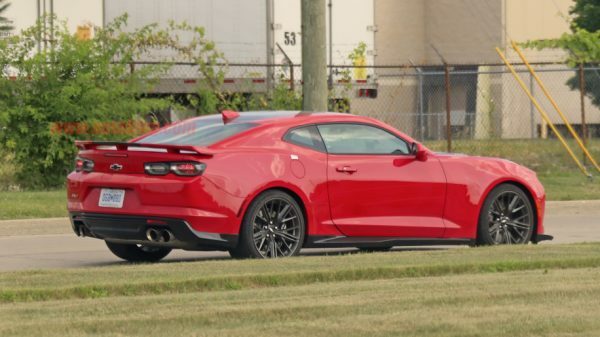 As with the rest of the 2019 Camaro lineup, the ZL1 gets much larger taillights featuring a quartet of illuminated rings. These taillights offer more depth and detailing than those on the outgoing model. The bumper is also changed to match the others with a simplified lip under the taillights and a redesigned license plate section. The rear wing and diffuser appear to be same as the old one, though. Pricing and availability for the mainstream Camaros have yet to be announced, so exactly when the new ZL1 will show up isn’t clear. We would suspect it would arrive not long after, or even at the same time, as the rest of Camaro line. We’re also not expecting any powertrain changes, so look for the same 650 horsepower and 650 pound-feet of torque as the last one coupled to either a six-speed manual or 10-speed automatic. Have You Met The New 2019 Silverado?